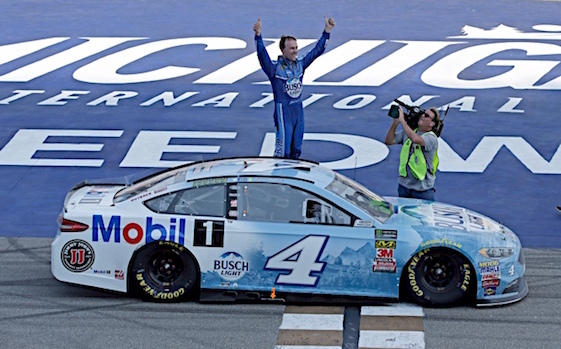 Kevin Harvick collected his series-leading seventh victory of the season when he drove away from the field late in the race to win the Consumers Energy 400 at Michigan International Speedway on Sunday. Harvick, driver of the No. 4 Stewart-Haas Racing Ford, led a race-best 108 of 200 laps at the 2-mile MIS oval in getting his 44th career victory. Finishing second, 3.2 seconds back, was Brad Keselowski in the No. 2 Ford of Team Penske. Finishing third was points-leader and six-race winner in 2018 Kyle Busch of Joe Gibbs Racing. Harvick won the first and second stages of the three-stage race to collect bonus playoff points. Dillon, the 2018 Daytona 500 winner and who was running second with three laps remaining, encountered wheel vibration with a couple of laps to go and lost whatever chance he had to beat Harvick. Three races – at short tracks at Bristol Motor Speedway and Darlington, and then at Indianapolis Motor Speedway – now remain until the start of the playoffs at Las Vegas Motor Speedway on Sept. 16. (3) Kevin Harvick, Ford, 200. (18) Brad Keselowski, Ford, 200. (2) Kyle Busch, Toyota, 200. (5) Austin Dillon, Chevrolet, 200. (8) Ryan Blaney, Ford, 200. (12) Kurt Busch, Ford, 200. (11) Aric Almirola, Ford, 200. (1) Denny Hamlin, Toyota, 200. (21) Chase Elliott, Chevrolet, 200. (9) Joey Logano, Ford, 200. (40) Daniel Suarez, Toyota, 200. (16) Clint Bowyer, Ford, 200. (4) Erik Jones, Toyota, 200. (7) Martin Truex Jr., Toyota, 200. (6) Ryan Newman, Chevrolet, 200. (14) Paul Menard, Ford, 200. (17) Kyle Larson, Chevrolet, 200. (13) Ricky Stenhouse Jr., Ford, 200. (10) Alex Bowman, Chevrolet, 200. (23) Chris Buescher, Chevrolet, 200. (15) Jamie McMurray, Chevrolet, 200. (25) AJ Allmendinger, Chevrolet, 199. (22) Bubba Wallace #, Chevrolet, 199. (30) Matt DiBenedetto, Ford, 199. (29) Michael McDowell, Ford, 199. (28) Kasey Kahne, Chevrolet, 199. (24) David Ragan, Ford, 199. (19) Jimmie Johnson, Chevrolet, 198. (31) Landon Cassill, Chevrolet, 197. (39) Blake Jones, Toyota, 194. (33) BJ McLeod(i), Ford, 194. (36) * Garrett Smithley(i), Chevrolet, 193. (34) * Gray Gaulding, Chevrolet, 191. (26) Trevor Bayne, Ford, Engine, 189. (35) Ross Chastain(i), Chevrolet, Axle, 187. (20) William Byron #, Chevrolet, 187. (37) * Timmy Hill(i), Chevrolet, Electrical, 138. (27) Ty Dillon, Chevrolet, Accident, 131. (38) * Jeffrey Earnhardt, Toyota, Engine, 102. (32) Corey LaJoie, Chevrolet, Engine, 37.